* Mutual help is the law of life. * An enduring joy of life results from right action. * Many live a noisy and anxious life in a sad attempt to avoid listening to their own soul. * The task of every human being is to build a ladder between the sky and the earth, in his consciousness. * In esoteric philosophy, there must be a harmony among different factors like one’s words, one’s feelings, intentions and actions. * The world does not need empty words or speeches made of pure wind. Those leaders and institutions whose action is based on lies have no great future. * Self-control and self-respect attract blessings. Be calmly severe with yourself, and life will seem to be easier. * Detachment grants peace, and one must be able to say “no” to some situations, in order to preserve one’s independence. * By hearing the voice of the silence in the soul one attains to the point of equilibrium in his consciousness, and to the axis of symmetry, in his karma. * Remember life is not about punishment and rewards. Life teaches us wisdom all the time. We are its students. There is no need to be lazy in learning, and the lessons can be found everywhere around us. * Life is about self-responsibility. In theosophy, self-control is unavoidable. The consciousness of the student cannot be put adrift by external haphazard facts or random factors of astral nature. * The purpose of suffering along the path is to test the pilgrim’s ability to keep his heart in peace. As long as there is the firm intention to try one’s best, the uncomfortable moments pass while peace remains. * One should practice the art of listening to Nature. As the wind touches the leaves of a tree, they both talk to the human heart. * To preserve and to expand your good will means that you are able to sow good karma for yourself and others. Each day you should check and verify the quality of your good will, and “fix” it whenever it is not working. * Actual freedom from ignorance does not occur just because one wants to obtain it. Detachment results from a knowledge of the many ways ignorance may work, and out of a commitment to constantly choose the way to wisdom and ethics. * Trees are intelligent beings and friends of all life. The intelligence of human beings, however, needs to expand further, so that all of them can see and feel the intelligence of trees, and interact with them in wiser and more responsible ways. * Danger is one of the teachers who guide the truth-seekers. It is impossible to work for the good of mankind without being challenged by various forms of organized ignorance. Because of the obstacles, we can better learn many and useful lessons. * It is not enough to have a good intention and noble goals. One’s effort must be correctly managed. A realistic agenda is needed for the present month and the months and years to come. Self-organization is a decisive factor in having efficiency. * Disguising lower-self feelings with beautiful or sophisticated speeches is not enough. As long as humanity is largely guided by selfish instincts, there must be pain, fear and hatred. Self-restraint and voluntary simplicity are among the main sources of happiness. * In astrology and theosophy, the correspondence is well-known between the sun and the human heart. Not everyone takes into consideration the fact that an enlightened mind becomes one with the heart and emerges, by its own dynamics, as an occult miniature of the sun. The teaching is present in the Mahatma Letters. * Spiritual ignorance consists in wasting life’s energies. Wisdom expresses itself in the preservation of the vital force and in its correct and brotherly use. One must observe, therefore, in which aspects of daily life we make a wise use of our energies, and in which aspects our efficiency ought to be improved. * Justice is about putting limits to error - especially intentional errors - and about stimulating right action. He who protects mistakes cannot stimulate correct action. While people must be accepted as they are, mistakes have to be corrected and compensated in a reasonable time, and further mistakes avoided. * While observing life one can easily see that deep and peaceful silence is bliss. The source of wisdom is in a place situated above all sounds and away from any images. However, one must deserve silence and bliss so that they are not a passing experience. Right action and right thought help create the proper conditions for a lasting peace of mind. * In seeking the truth, patience is as important as prompt action, for some facts have the speed of a lightning. Although one must develop detachment and a sort of indifference regarding the external world, this must be compensated by the ability to quickly respond in an intense way to any new situation, if necessary. * To have a simple heart is not the same as being naive. There is a difference between transcending the complexities of life and being unable to see them. The light of happiness shines best in a simple heart. However, one can only attain to simplicity by sharply identifying and saying “no” to all falsehood and make-believe. * In order to learn about the most elevated, a feeling of devotion and respect is needed, and one’s mind must be equally free to investigate and question facts. The intelligence of the soul is both intellectual and emotional in nature. It must be intense and sincere in the two levels of consciousness. The forms of intelligence where one can’t find this simultaneity do not belong to the advanced aspects of spiritual soul. On the other hand, a predominance of noble feelings is the main guarantee of intellectual clarity. The heart is the center of wisdom: every wise mind, however questioning, is at the service of the heart. The heart works with truth; it can see it all and accepts no falsity or treason. * The yoga sutras of Patanjali teach students to systematically replace wrong thoughts and ideas with correct and truthful ones. Performed in the context of the search for universal wisdom, this practice changes the Karma of the individual and enables him to transcend socially organized mediocrity, while strengthening his connection to the higher aspects of the Karmic Law. See Book II, aphorisms 33-34. 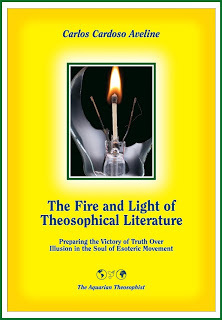 An initial version of the above fragments was published in the April 2015 edition of “The Aquarian Theosophist”. It had no indication as to the name of the author. The other articles of the series “Thoughts Along the Road” can be seen in our Associated Websites.